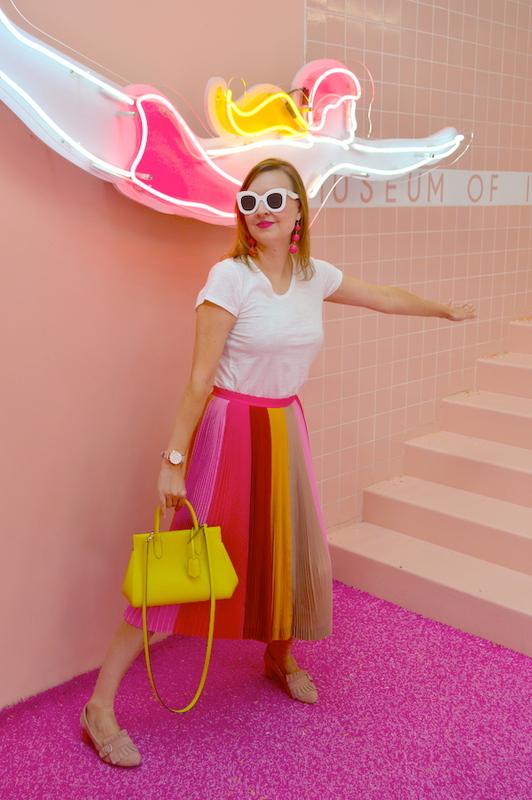 I'm sure that by now some of you might be sick of seeing pictures of the Museum of Ice Cream—the images of bloggers standing next to giant popsicles or a sea of bananas have been omnipresent on Instagram lately—but if not, here are some more! 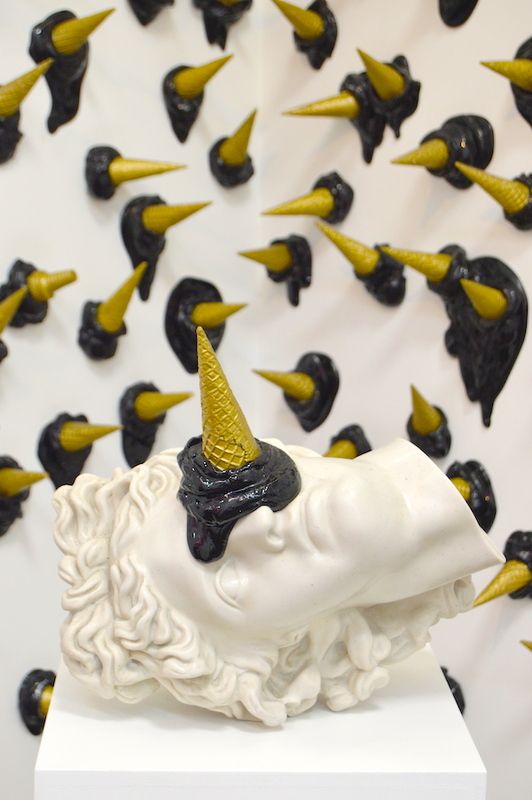 I must admit that I had mixed feelings about the Museum of Ice Cream. On the one hand, I wanted to scoff at something that is not really a museum but, rather, simply a maze of rooms designed for cool pictures for one's Instagram feed. 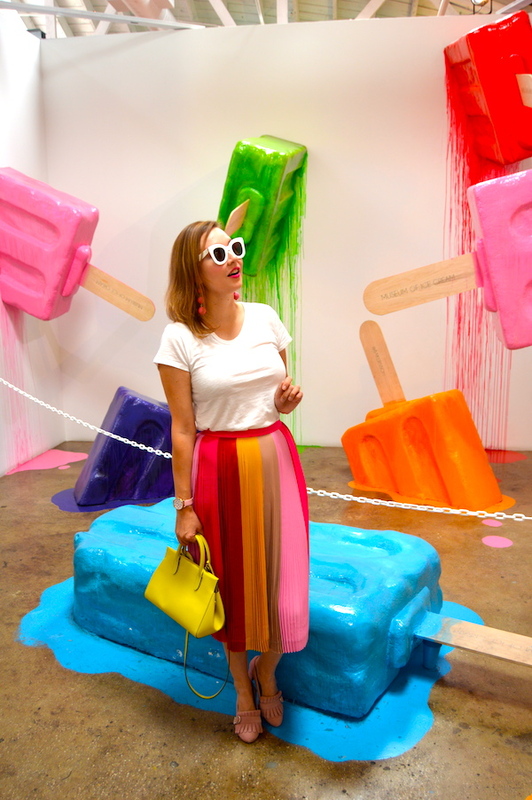 On the other hand, it is super colorful, there's ice cream, and did I mention that you can get some really cool pictures to fill your Instagram feed for months? As you can see, I definitely have two warring sides of my personality and, in this case, the latter won out. 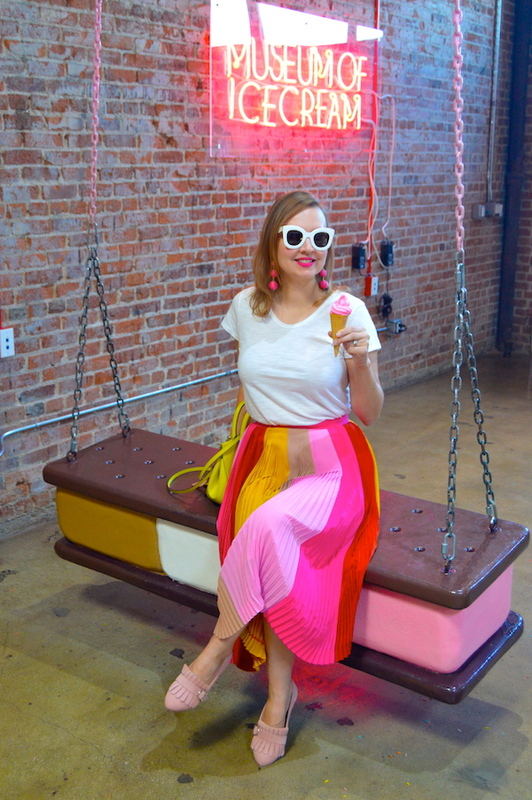 So allow me be your Virgil and guide you through the odyssey that is the Museum of Ice Cream! Your ice cream journey will begin outside with you taking the oath of ice cream. Yes, you take an oath of ice cream! Mostly the oath consists of you vowing not to touch the popsicles and bananas. (Come to think of it, that sounds pretty phallic!) 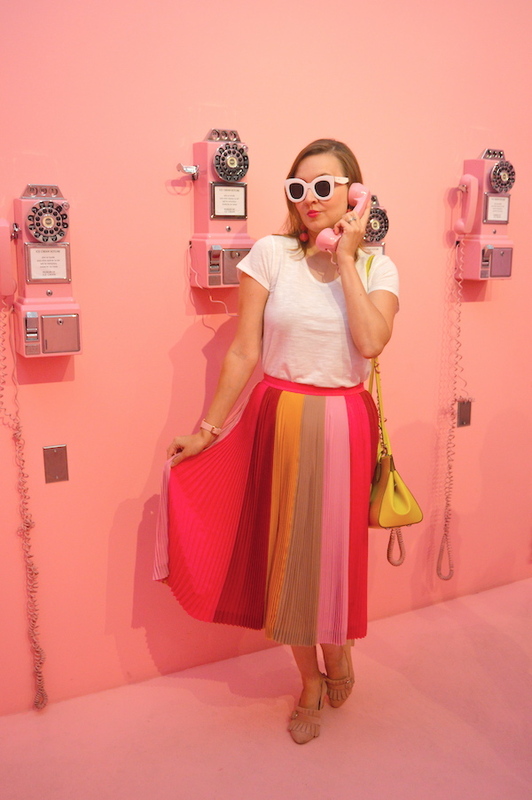 You are then ushered into a pink antechamber filled with pink phones where you wait for them to let you out into the museum proper. 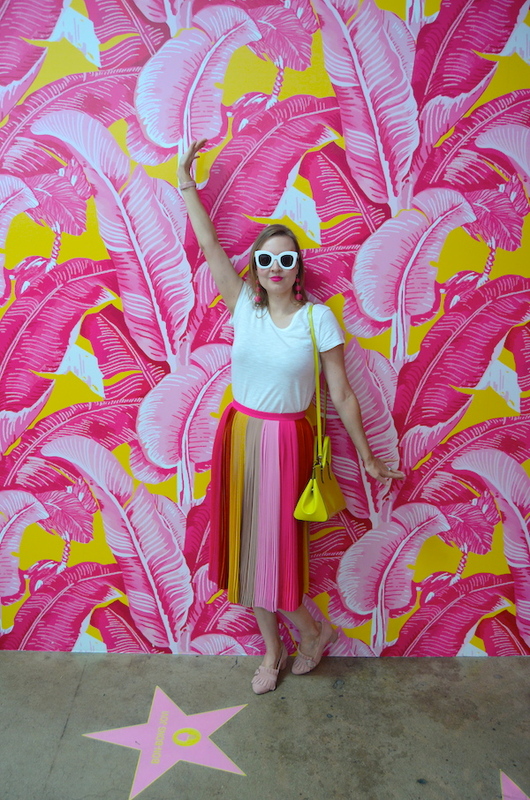 The nice thing about the museum (and how I got my husband to sign on for the adventure!) is that they give you plenty of sweets along your journey! The sweet treats commence with a small taste of Dove chocolate to give you the much needed sugar rush to propel you through the rest of the museum. 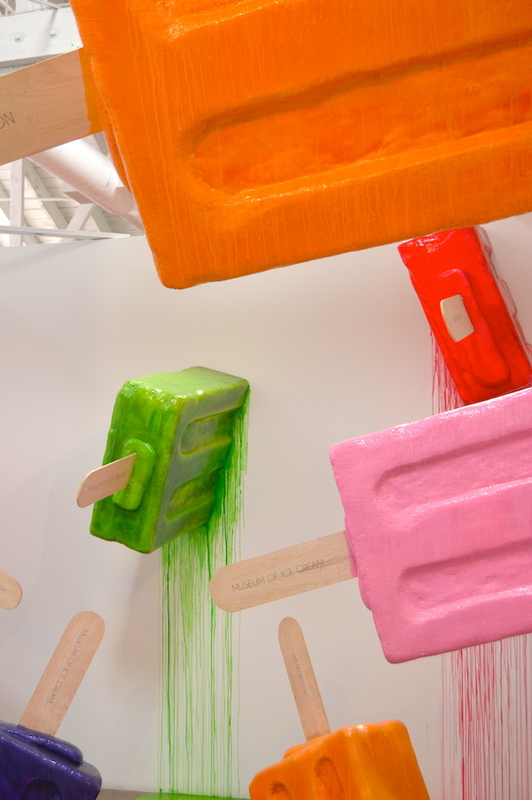 The sugar high continues throughout the museum as you sample ice cream (of course! ), mint mochi, gummy bears, licorice, malt balls, and candied fruit. And the experience concludes with...more ice cream, of course! 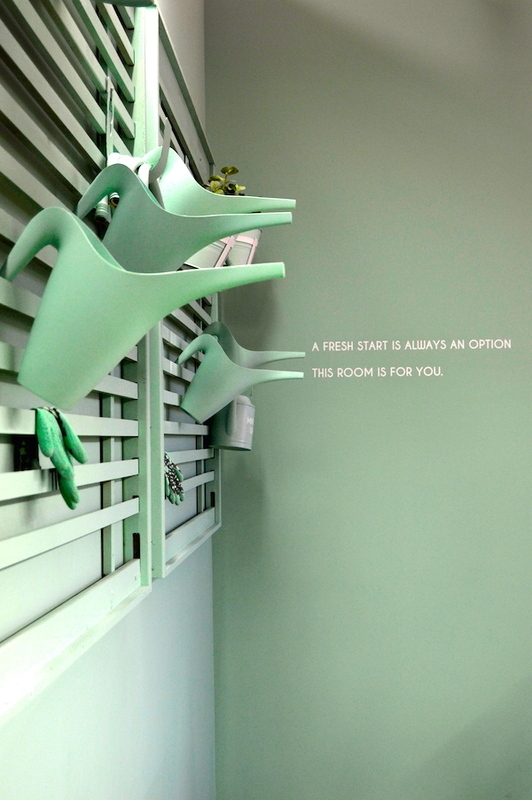 After you get into the museum, there are about ten or so crazy and strange rooms that each have a specific theme. The room featured above with head the Apollo Belvedere taking an ice cream cone to the eyeball was designed by an actual artist, although I'm not sure of his or her name. While the room is interesting, I'm not sure what the point is other than to have something that's visually shocking and strange. 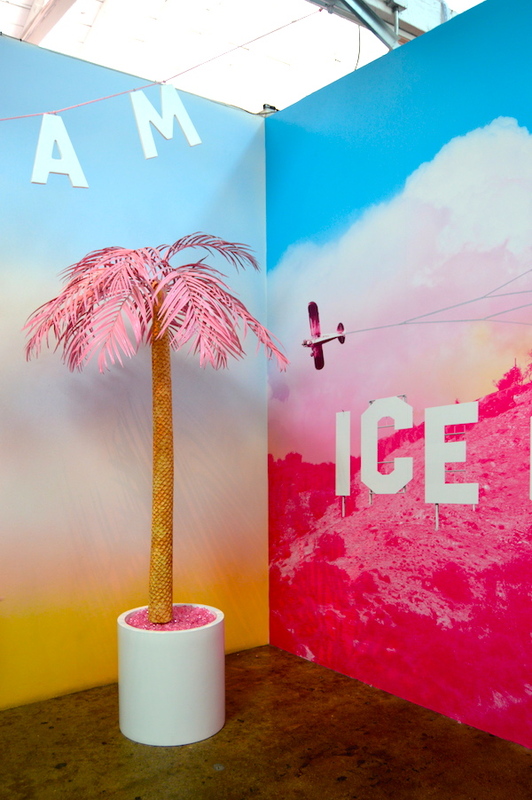 One of the most difficult things about the Museum of Ice Cream was coming up with different ways to pose and interact with the environment if you want to get really artsy about it. Ironically, my husband of all people encouraged me to amp up the "cheese" factor. By the end of museum, I kind of ran out of fun faces and poses to make! You are also competing with a lot of other people, all trying to get a clean shot of themselves, so it becomes kind of cut throat! If I was a celebrity like Gwen Steffani, I would probably just rent out the space for an hour to take pictures! Gwen really should check out the banana room too, because of the chorus in her song "Hollaback Girl"! In the above gummy bear room they hand out gummy bears but there's a catch: you have to do the gummy bear jiggle in order to get the candy and they insist on recording you doing it! My husband, who really, really wanted gummy bears went along with it, which is a testament to the lengths he will go to for gummy bears! Suffice it to say, the video of us doing the gummy bear jiggle will never see the light of day due to the fact the my husband is vehemently opposed to appearing on or engaging with social media in any form! I did get a bit of his shoe in one of my pics for my Instagram Story, so that's the most you'll ever see of him! So, in conclusion, as much as I might have mocked the experience of visiting the Museum of Ice Cream, it was actually a lot of fun. Truth be told, I think my husband secretly enjoyed it too. 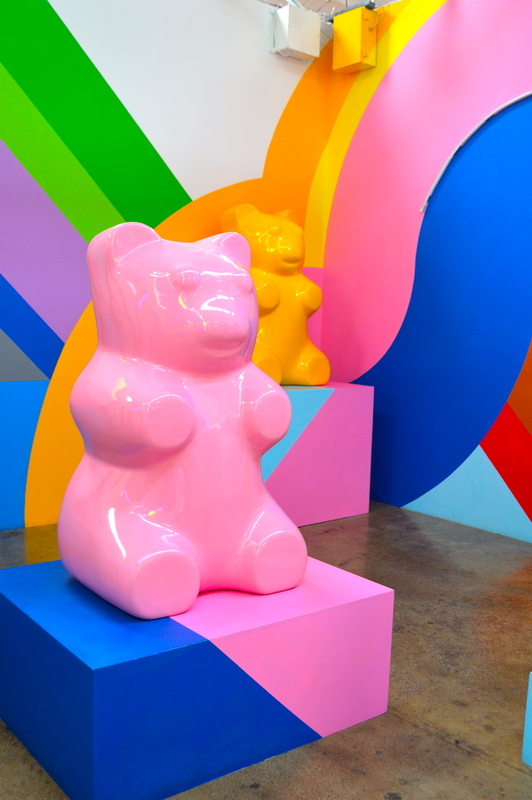 If you want to go to the Museum of Ice Cream in Los Angeles, they are releasing more tickets that go on sale on Wednesday, October 18th. They claim this is their final extension, but much like the Rolling Stones that keep saying it's their farewell tour or final album, they'll probably be back for more! 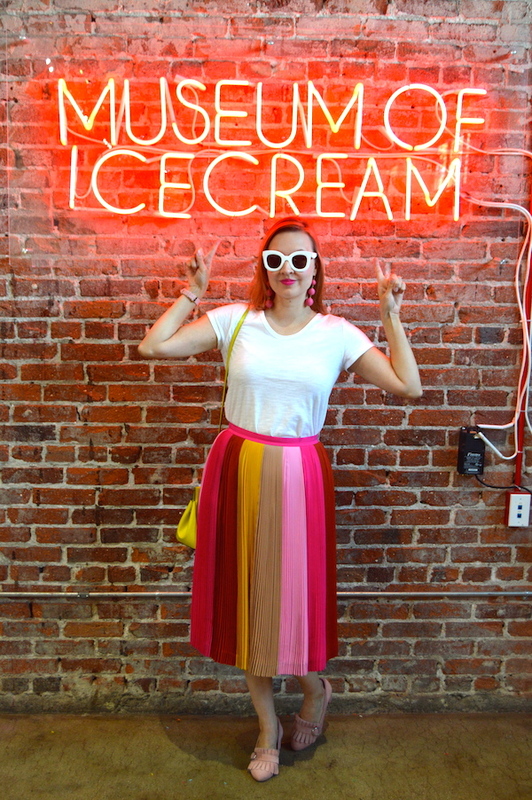 Also, if you are near San Fransisco, there is a Museum of Ice Cream currently open there too! Perhaps my husband and I should make a pilgrimage there and continue our ice cream odyssey? 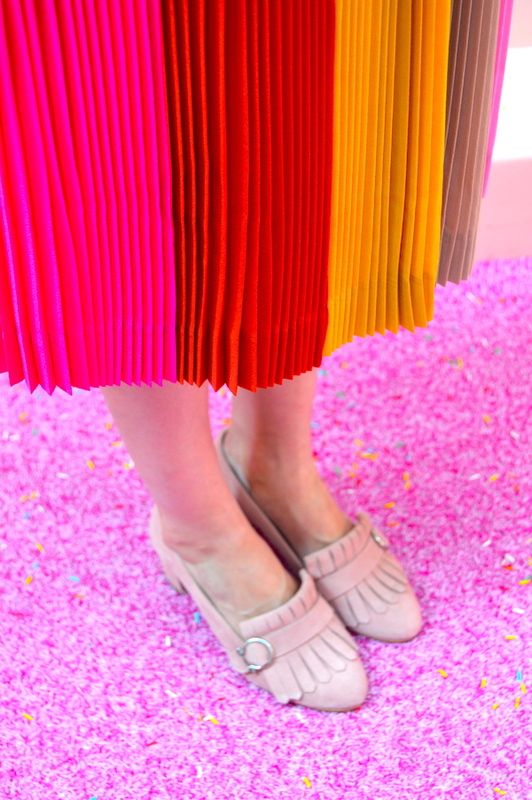 Could you have worn a more appropriate skirt for your visit? The colours are just perfect for the Ice Cream Museum! And your photos are really entertaining. And I agree with you about not going into the sprinkles pool! I really wish I was going to have the chance to visit there!! All of these pictures make me so happy, and your outfit was PERFECT! !